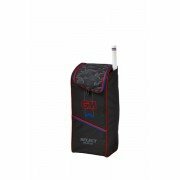 At All Rounder Cricket Equipment we offer the widest range of Gunn and Moore cricket bags. The choice of cricketers such as Ross Taylor, Alex Hales, Quinton De Kock and Chris Read. With Gunn and Moore you know you will be using the best quality equipment at a very competitive price from All Rounder. As always Gunn and Moore excel with there bag range and this year is no differnet with a great range of newly designed bags that have proved successful in previous years such as the Duplex Wheelie, Easi-Load, 808 5* and the best selling Original Duffle, along with the addition of some innovative designs such as the highly anticipated Original Wheelie Duffle which is sure to be popular for 2019. Size DVO Closed - 92cm x 37cm x 48cm. Volume in litres - 163. Size DVO Activated - 92cm x 37cm x 56cm. Volume in litres - 191. 1680 denier Polyester fabric, hard wearing. Integrated two tone all terrain wheelie system. 'Bat cave' preformed bottom section to hold two full sized cricket bats, protecting the bats from damage. Stand alone Easi-Load system makes loading easy even when empty. The bag will also stand vertically which allows access to the centre section meaning better use of space in smaller changing rooms. 10mm heavy duty 'D' opening rust proof zips. Anti - scuff corner protetion for added durability. Size - 96cm x 41cm x 32cm. Volume in litres - 126. A great new addition to the Gunn and Moore bag range for 2019. The Original Wheelie Duffle bag offers complete versatile manoeuvrability. Zipped side pockets to fit full sized pads. Adjustable padded shoulder straps which can be stored away if using as a wheelie stand up bag. Versatile loading and access with a choice of compartments for various equipment combinations. Rust proof GM designer zips. Anti-scuff corner protection for added durability. Integrated bat pockets for 2 bats. Integrated all terrain wheelie system. Size DVO Closed - 92cm x 36cm x 41cm. Volume in litres - 136. Size DVO Activated - 92cm x 36cm x 49cm. Volume in litres - 162. New moulded rubber handles (one each end) for easy pulling, carrying and comfort. Two zipped side pockets for extra storage. Two integrated external padded bat pockets. 10mm Heavy duty 'D' opening. Integrated two tone all terrain heavy duty integrated wheel system for durability. Size DVO Closed - 90cm x 28cm x 31cm. Volume in litres - 78. Size DVO Activated - 90cm x 28cm x 39cm. Volume in litres - 98 litres. 2 zipped side pockets and a zipped end pocket. New moulded rubber padded handles for easy pulling and comfort. 10mm heavy duty rust proof GM designer zip pullers. Size - 98cm x 36cm x 31cm. Volume in litres - 109. A versatile large duffle bag to meet the demands of the modern cricketer. Gusseted side pockets will hold two full size bats safely and securely.